This rustic For the Birds Sign will add a bit of whimsy to your home. This painted yellow sign features two red cardinals and the salutation "This place is for the Birds". This rustic For the Birds Sign will add a bit of whimsy to your home. 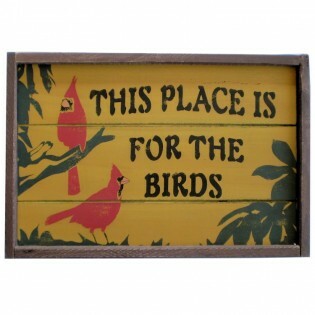 This painted yellow sign features two red cardinals and the salutation "This place is for the Birds"